he has very kindly agreed to allow me to reproduce the text of some of them here. There are only about eight or so competition altereds in the country that will run the quarter in under eleven seconds. At the time of writing just four had cut nines and these are powered by blown and/or injected fuel-burning hemi-lumps. Kevin Pilling, one of the most enthusiastic drag racers you'll find, wants to be the first man in the nines to rely on an unblown, carburated, petrol swilling wedge-headed Austin Seven. By comparison with some big-block altereds Kevin's car - an Avon Special version of the once-popular Austin Seven packing a 440-cube (7.2 litre) Dodge mill - is a low-budget machine. You may not think £700 is cheap, but on value for money the car is untouchable. Dubbed Pure Seven, this Dodge-powered device is co-owned by Dave Rogers and took only six months to put together, with many of the parts coming from Kevin's earlier project, an Olds altered. Best time so far has been 10.18 seconds coupled to a terminal of 139.36mph. The motor is a 'B' wedge from a '70 Dodge - the sort of mill found in dream machines like the Dodge Charger. Thanks to a whole bundle of go-quicker goodies, many of which Kevin personally humped home from Los Angeles, the motor is reckoned to kick out somewhere in the region of 550bhp and Kevin's only problem seems to be putting the power on the ground. 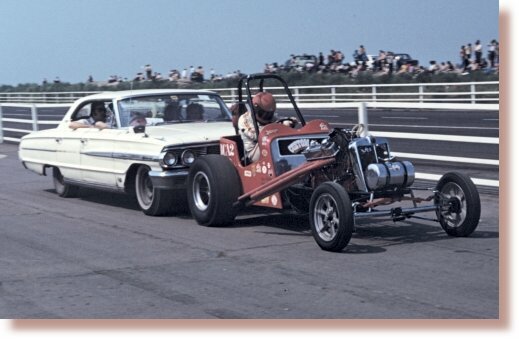 Even with massive M&H slicks hung on the back, the orange and black car smokes and bounds its way up the asphalt. Engine innards comprise a stock forged-steel crank, Arias 12 1/2-to-1 forged pistons, Perfect Circle rings, Howard forged rods, Clevite 77 bearings, Ramchargers valves and a Racer Brown cam. The inlet manifold, which holds a big Carter carb, feeds the wedge pure pump gas. Mag is a Scintilla, igniting Champion spark plugs. Pure Seven's lubrication system relies on regular doses of STP-charged Valvoline Racing Oil and is protected by a GUD filter. Transmitting power from the steel billet flywheel is an American Weber clutch (surrounded by a very necessary steel scattershield), which mates with a two-speed manual box from a Caddy. Following on from a home-built propshaft is a '61 super-strong Olds rear axle, narrowed and fitted with 4.1 gears. Hubs are custom-made carrying Lola (dare we say it?) roundy-round mags and the 10-wide M&H boots. There is no rear suspension, unlike the front end, which sports an Austin Seven hubs/spindles/springs set-up plus a pair of Lambretta shocks on a chromed Allan Herridge axle. Mag wheels carry Michelin 135-15 front tyres and are pointed by a Standard 10 steering box. The car's chrome moly frame is built from 1 1/4in. by 16g steel, with the rollcage using 1 5/8in 10g metal. Wheelbase is 98in. Kevin stops with the aid of rear drum binders plus the added safety of a 12ft full-circle Irvin chute. Pure Seven's orange and black paint job was sprayed over the aluminium bodyshell in Kevin's own paint shop. Most of the work in preparing the car was in the hands of the owners, though a considerable amount of time and assistance was donated by Allan Herridge and John Harrison.